Editor’s introduction: What’s more bizarre than one mistake on a card? Easy: Two mistakes. WRONG! How about three mistakes on one single card? Check out Chapter VIII of Keith Adams‘ Magic Oddica to learn more about cards with multiple mistakes. In my previous segments, I have shown you some Magic: the Gathering cards that have a misprint- the one thing that would set it apart from a “normal” card. However, there is nothing that prohibits a card from having more than one thing wrong with it. Very few cards are made with one mistake on it, but a much, much more select amount of cards can be printed with a multitude of mistakes. And that is what I am going to cover this week. Many of the topics I have covered in the past, and will cover in the future, will only focus on one subject. But I do want to show the ability to have a combination of mistakes. Usually this means a combination of two errors, but why not show you just how bad things can get? I recently covered square cornered cards, as well as cards with an upside down back for a reason. Here are some foil cards that have square corners, with a back that is upside down AND miscut– a full THREE mistakes on one card. These cards all came from one sheet, with the same exact mistake on each card. Don’t expect to see this very often, however. It’s rare enough to find a misprinted card, even harder to find something with more than one thing wrong with it. Of all the misprints I’ve seen, easily more than 95% of them have only one thing wrong with them. 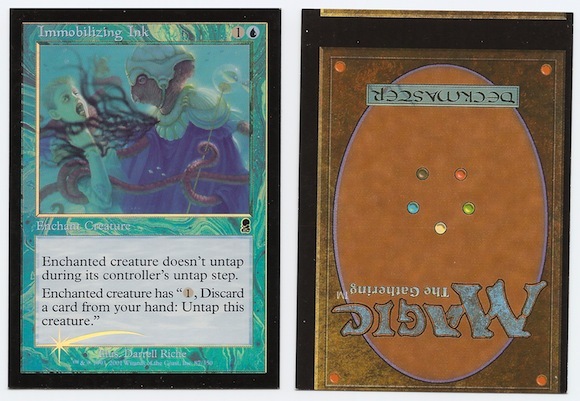 However, those other 5% of cards do stand out as the ultimate meaning of “misprint.” Wizards is far from perfect, just like all of us…. but I just wanted to show you how strange things can get. If it’s theoretically possible to make the mistake, chances are it has happened at some point. So just keep this in mind when I showcase something. I will most certainly show you some examples of combined misprints in the future, as they are without a doubt some of my favorites. They always make me stop and think… how could they have screwed up so badly? As I mentioned before, cards with square corners are not tournament legal. And with miscut cards, there will be a full sheet that has the same mistake on it, well over 100 cards exist like these foil commons I am showing you. I’ve only seen seven of these, so I know there are more out there somewhere! And as always, here is a video where I showcase more copies of these cards. Enjoy.